My eldest, Joshua, is in the middle of his final exams. Like the best of us, he’s looking for a few procrastination strategies which, fortunately for our household, took the form of making veggie pakoras today. Spicy. Deep-fried. Oniony. Crunchy. What student could ask for anything more? What mom could be happier to smell the sweet smell of home-cooked goodness in the house? What food blogger could be more pleased to swoop in and post the results? Heat up the oil in a karahi or wok over medium heat. Slice the onion lengthways very thinly and place in a bowl. Peel and grate (or very finely chop) the potatoes into the same bowl. You can also use aubergines and cauliflower – chop into very small pieces. Test your oil is hot enough by dropping a little batter into the oil. If it browns and rises immediately then it is ready. Very carefully drop in spoonfuls of the mixture into the oil and fry until golden brown. 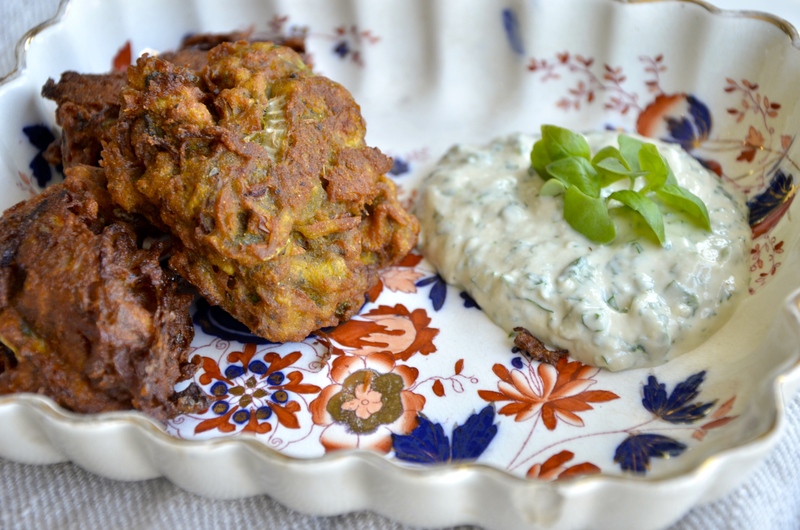 Using a slotted spoon move the pakora around, be careful not to overcrowd them. Once golden brown and crisp remove from the oil and set on some paper towel. Serve with a yummy raita or a vegan-version tahini dip. Thanks to Hari Ghotra for Joshua’s inspiration. Unbridled credit for this recipe (and photo) goes to my daughter, Rebekah (and of course the original blog, The Gouda Life, from whence the recipe came). Bekah is home for reading week and craving all things healthy and non-residence. 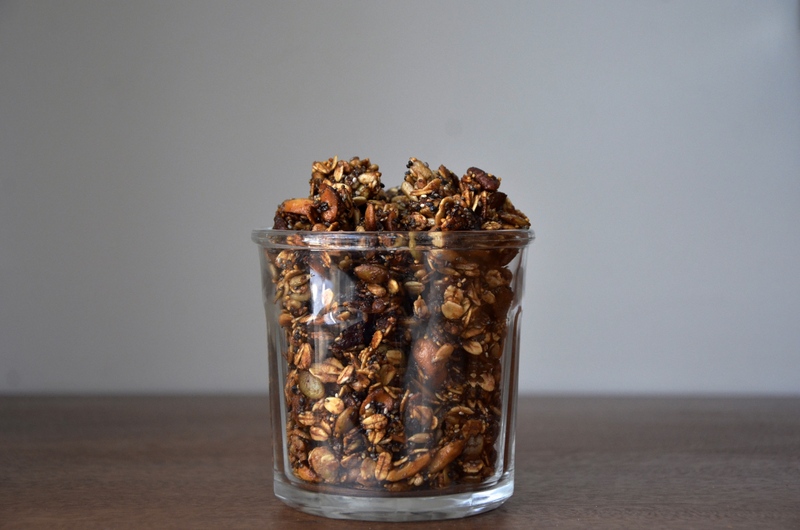 This snacking granola is perfect because it’s, of course, healthy – full of dates, chia seeds, nuts, and oats – but it’s also both crunchy and chewy, sweet and salty, nutty and fruity, a breakfast and a snack – all in one. Place the chopped dates, cranberries, cinnamon stick and syrup in a small pot over medium heat until it starts to bubble. Turn the heat down to a simmer and let the mixture bubble away for 8-10 minutes. By then, you should be able to use the back of a fork or spoon to mush it all together. It should be similar in texture to applesauce with some extra liquid from the syrup seeping out. Remove from heat and let cool. In a large bowl, mix together all the other ingredients and stir to combine. Pour the slightly cooled syrup mixture over the dry ingredients and stir everything together with a spatula until all the oats/seeds/nuts are covered in the syrup. Turn 1/2 the into a large, high-sided cake pan (I used a 15” x 10” x 2” rectangular baking dish) and pack the mixture down as hard and evenly as you can. 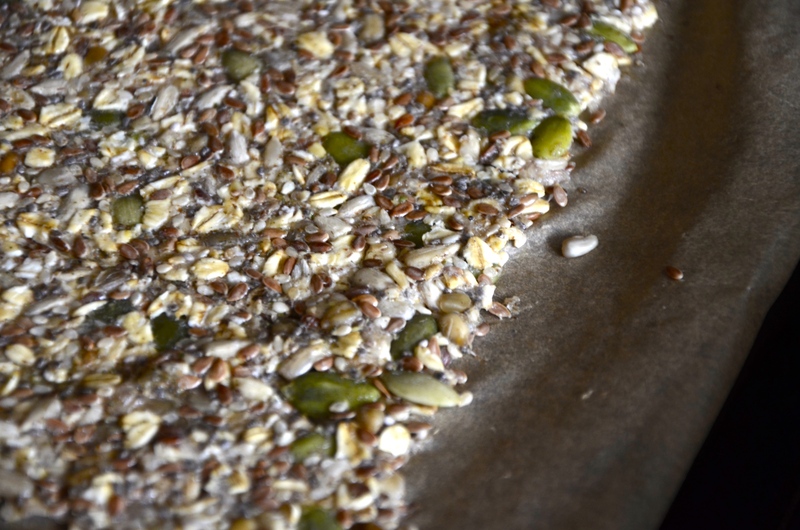 Add the rest of the oat mixture and press into the pan. Bake for 40 minutes. Remove and cool for 20 minutes. Break up the mixture into large clusters and place back in the pan. Bake for an additional 10-15 minutes for crispy-edged clusters. Filed in Breakfast Fare, Got the Munchies? There is a beef in my house which is flying things unnecessarily from around the planet that we could easily get and/or make here. Fizzy water is one. Mustard is another. Crackers are high on the list as a third. So when Rebekah found this recipe for seedy crackers on My New Roots blog, which she loves, I thought I’d give them a try. 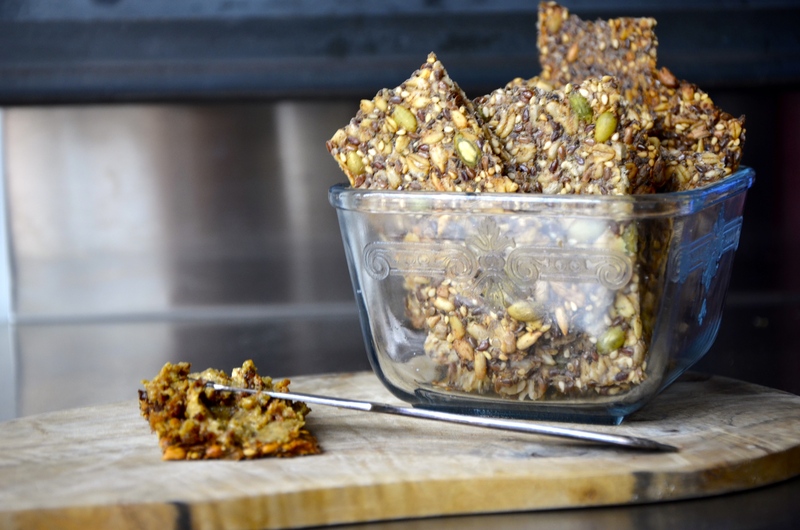 They are kind of a cross between a cracker and a granola bar – full of oats and seeds and seasoning. The rosemary, garlic and smoked sea salt could be left out or replaced with any other seasoning that tickles your fancy. And with a little veggie pâté, hummus, or sun-dried tomato pesto, they eat like a feast. In a large bowl combine all dry ingredients, stirring well. Whisk maple syrup, oil and water together in a measuring cup. Add this to the dry ingredients and mix very well until everything is completely soaked and dough becomes very thick (if the dough is too thick to stir, add one or two teaspoons of water until the dough is manageable). Divide the dough roughly in half. Gather half the dough into a ball and place it between two sheets of baking paper. Using a rolling pin, firmly roll out into a thin sheet. Remove top layer of baking paper and using the tip of a knife, score the dough into shapes you like (I chose large rectangles but it’s up to you). Repeat with remaining half of dough. Let sit out on the counter for at least 2 hours, or all day or overnight. Preheat oven to 350°F. Using the baking paper, slide the dough onto a cookie sheet and bake for 20 minutes. Remove cookie sheet from oven, flip the whole cracker over (if it breaks a bit, don’t worry!) and peel the baking paper off of the back. Return to oven to bake for another 10 minutes, until fully dry, crisp, and golden around the edges. I just watched this fabulous video of Michael Pollan on How Cooking Can Change Your Life. A must-see in my books as he argues so eloquently and passionately about the role of cooking, not just in our lives, our families, our health, our enjoyment, and so on, but in our whole food system as well. I’m sold. I have been for awhile, but now I’m really sold. I know for many cooking regularly and systematically seems daunting but with a few acquired habits and simple changes, it’s easier than one might think. Take my lunch the other day as an example. I could have gone out to a restaurant, or ordered a pizza, or picked up a quick sandwich to go but I had stale baguette, I whipped up this hummus in about 10 minutes and, presto, lunch is served. And it was delicious. And healthy. And simple. And everything that Michael Pollan was talking about. Of course it’s not always this easy but start small, think big. Baby steps towards letting cooking change your life, and our planet. Heat the oil in a skillet, add the shallots, garlic, chopped rosemary, and lemon zest and cook over low, stirring occasionally, for about 5 minutes. Transfer the shallot mixture to a food processor, add all the remaining ingredients and process until smooth. 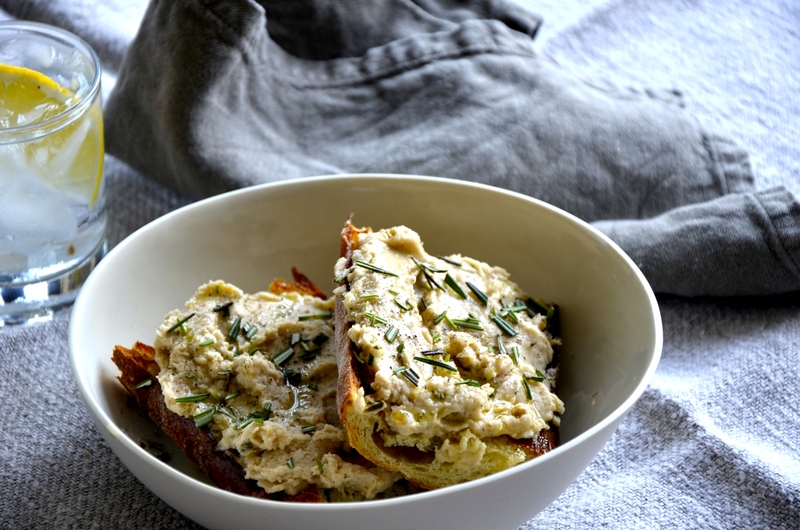 Serve on toasted baguette, drizzle with olive oil, and garnish with a few rosemary sprigs. 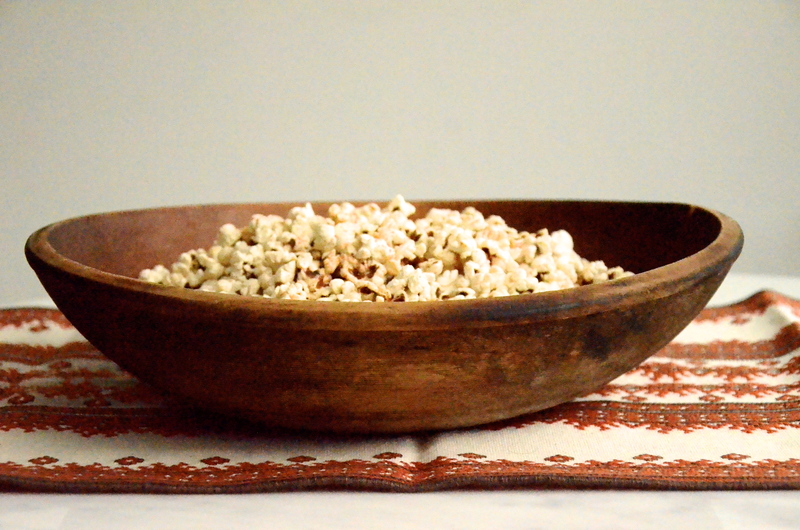 Many of us have grown up with butter-drenched popcorn, so what to do when you don’t eat butter? I’ve tried just plain old popcorn, or adding a topping or two, but it wasn’t until Rebekah came home with a recipe from a recent trip to visit her friend Emma in Massachusetts that I was totally satisfied in a butter-drenched kind way. It’s not tricky or complicated, just good. Wholesome goodness with coconut oil, simple olive oil, sea salt, and natural seasoning. This recipe features smoked paprika but there are innumerable ways to approach it from curry powder to fancy sea salt to cumin and coriander. But be warned, it’s highly addictive. Heat coconut oil in a heavy-bottomed pot or dutch oven until melted and it forms a thin layer on the bottom of the pot. Turn heat down to medium or medium-low and add popcorn kernels. Put the lid on the pot and leave to pop without stirring or fussing. Once all the kernels have popped, add sea salt to taste, paprika if using, and toss well. Serve. These little morsels of heavenly, healthy finger food are fabulous for party appetizers, for a light dinner with steamed kale and smoked tofu on the side, or as a snack mid-afternoon when the munchies hit. I’m also thinking that they’d be awesome for a road trip. 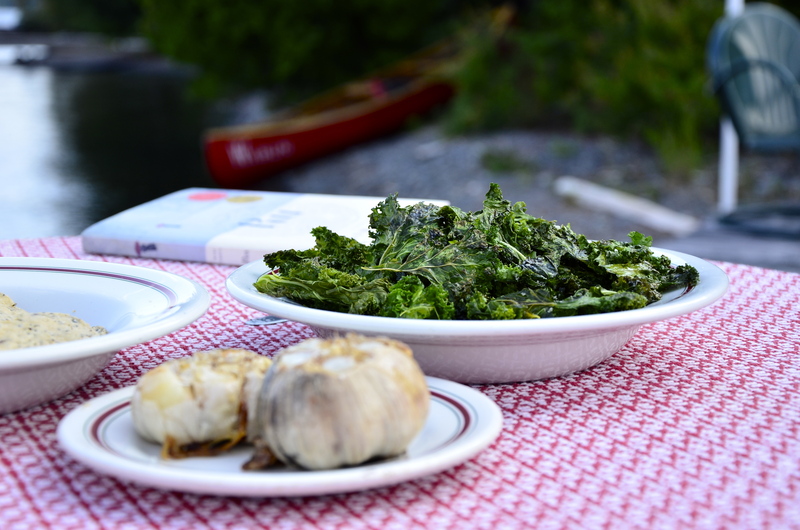 We have a few ahead of us this summer and I already can’t wait to pull over beside a little northern stream and eat these for lunch instead of being forced to pull over at a roadside diner or the standard highway mega-chains. Balls to that! I’m having modern-day traveling sushi packed full of carrots, green onion, and seaweed to go. Rinse the sushi rice and and then cook according to directions. Meanwhile, in a large bowl mix together rice vinegar, sugar and salt. Add carrots, green onions, and seaweed. Mix and set aside. Toast the sesame seeds in a skillet over medium-high heat until they are golden brown and their nutty flavour starts to come out. Stir constantly to make sure you don’t burn them. Transfer to a bowl and set aside to cool when done. When rice is done, turn off the heat and let it sit for about 10 minutes to cool. After 10 minutes or so, place rice in the bowl with the vinegar, carrots, seaweed etc. Stir gently but consistently for about 3 – 5 minutes to let the steam escape. At this point you can leave the rice to cool for 1 – 2 hours or you can start to form the balls immediately. To form the balls, take a spoonful of rice and roll it out between your hands. It helps if your hands are damp (it is sticky rice after all!) so keep a bowl of water nearby to occasionally wet your hands so the rice doesn’t stick to you. 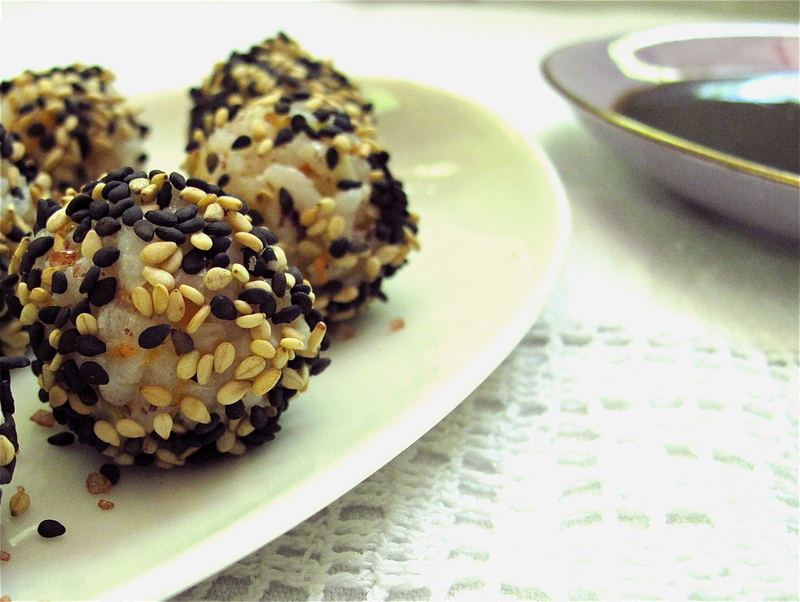 Form all the balls and then roll the balls in the sesame seeds to lightly coat them. Refrigerate the balls until you are ready to serve. Let them sit at room temperature for about 10 minutes before serving. Set them out beside a small bowl of tamari and a few drops of sesame oil for dipping.